For example, The Lectionary Page psalm for Sunday, September 28 is Psalm 78:1-4, 12-16. In turn, the DOR psalms highlighted in this post will be from the readings for Wednesday, September 18 (“more or less”), up to the readings for Tuesday, September 23. Psalm 78 will be discussed below, but first here are some highlights from last week’s DORs. and your power to all who are to come. Which is being interpreted: If the person who wrote Psalm 78 – or any other psalm – were alive today, he’d probably “get the word out” through a blog like this. And finally, the DORs for Tuesday, September 23, included Psalm 78:2, “I will open my mouth in a parable; I will declare the mysteries of ancient times.” On that note, Jesus specialized in the parabolic method of teaching – of teaching through the use of parables – a method discussed in On three suitors (a parable). That included a discussion of the problems inherent in trying to “strictly” or “conservatively” interpret a parable, as some try to do. Which leads to the valuable lesson: There’s a big difference between “arguing with God” – see On arguing with God – and “deliberately challenging God,” or defying Him, or being too skeptical about His ability to “deliver us from evil,” as detailed in Psalm 78. As to David playing the harp, see David – Wikipedia, the free encyclopedia, which noted the account of First Samuel, Chapter 16, which told of Saul, the first-ever king of Israel, being tormented by an evil spirit. 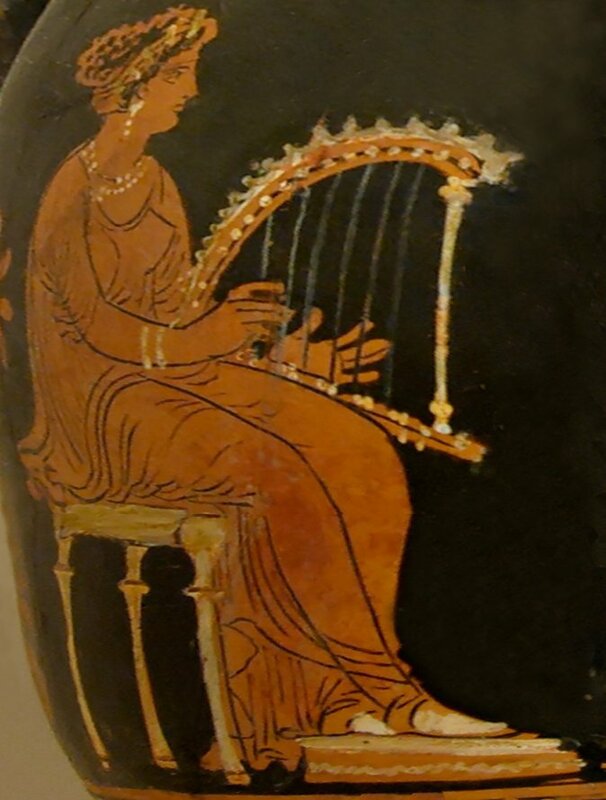 In turn it was suggested that “he send for David, a young warrior famed for bravery and his lyre playing. Saul did so, and made David one of his armor-bearers. From then on, whenever ‘the spirit from God came on Saul, David would take up his lyre and play. Then relief would come to Saul; he would feel better, and the evil spirit would leave him,’” as illustrated above. As to deliver us from evil: The Lord’s Prayer “concludes with ‘deliver us from evil‘ in Matthew, and with ‘lead us not into temptation’ in Luke.” See Lord’s Prayer – Wikipedia, the free encyclopedia. For another take on the psalms in general, type “Thomas Merton” in the Search Box above right. This entry was posted in Daily Office readings, Sunday Bible readings on September 24, 2014 by dorscribe@aol.com.